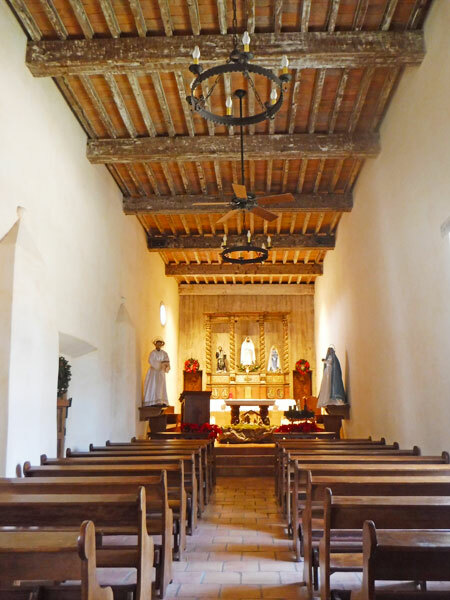 Here at Mission San JosÃ© you get an idea of the mission layouts. A large plaza is walled in with native quarters lining the inside of the walls. Directly ahead is the church with priests’ quarters on the right. In its heyday the plaza was full of people working hard to run this self-sufficient community. I’ve been to sites where the Incas and Mayans were conquered by Spaniards establishing a New Spain. I remember reading about killing, enslavement, and forced labor in mines. I was surprised to learn that the Coahuiltecan people of southern Texas had a completely different experience. Maybe it was because there was no gold or silver to mine. I don’t know. Whatever the reason, they got priests instead of soldiers. And instead of being subjugated, they were trained to become citizens of New Spain. The Coahuiltecans, like many other southwestern inhabitants, were having a rough go of it in the early 1700s. The way of life they had practiced for centuries was being threatened by nomadic tribes from the north. Also, Spanish invaders to the south had brought diseases which the area’s indigenous populations could not resist. Enter the Franciscan priests of the new world. Their vision was to establish missions, each a day’s travel apart, up the San Antonio River to what is now San Antonio. They were sure that in a decade or so they could build each mission, teach the locals how to be loyal, productive Spanish citizens, then turn the missions over to them and move on. 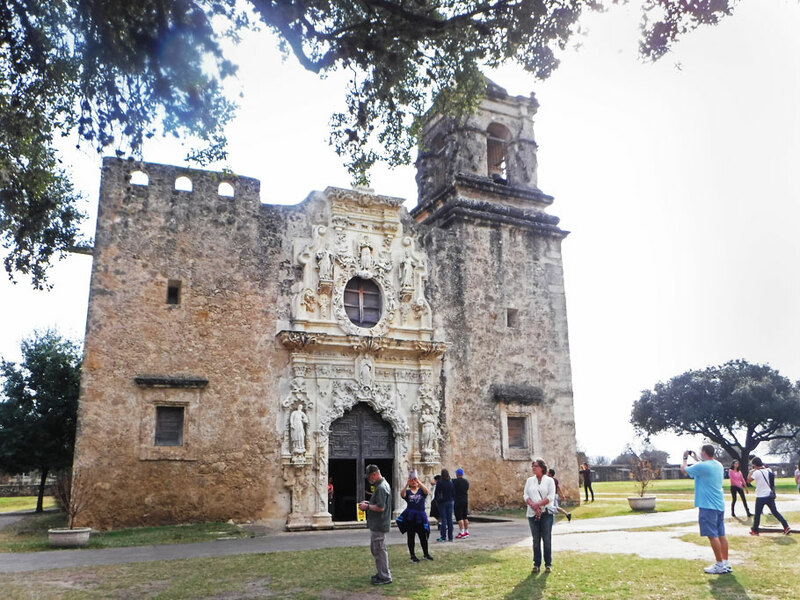 At the San Antonio Missions National Park we learned how well their plan worked. We visited four of the five missions. 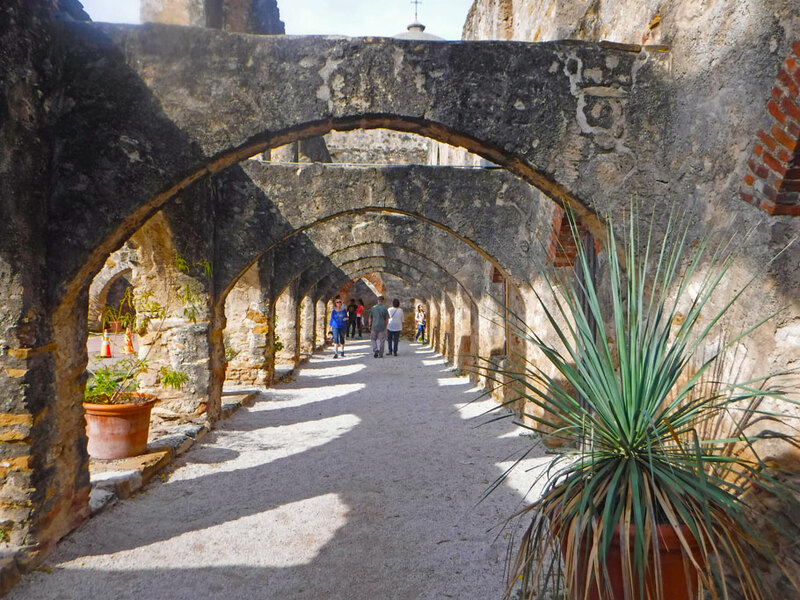 We skipped Mission San Antonio de Valero (The Alamo) because it was so crowded. While the mission layouts all have common elements, it was clear by their differences in appearance that the individual priests were given lots of leeway by their superiors. Now the priests wanted to win over the hearts and minds of the Coahuiltecans, but they started with their bellies. Here was the deal. The priest would show you how to produce enough food for your people to survive. All you had to do in return was work building and running the mission, join the Church, obey the rules, and learn Spanish and Latin. Lots of people joined up. But things didn’t go as smoothly as planned. Many were lost to disease. And the Apache and Comanche continued their raids. Instead of ten years, it took a generation for the missions to thrive. After 1800, though, they were finally turned over to the communities they now served. The Franciscan approach worked. Granted, the loyal subjects of Spain briefly became disloyal subjects of France, then Mexicans, then Americans, then part of the Confederacy, and now American Texans. But the elements of New Spain are deeply rooted in their current Tejano culture. Beyond the walls of Mission San JosÃ© was farmland. Farther still, young boys would be tending cattle. Everyone worked. 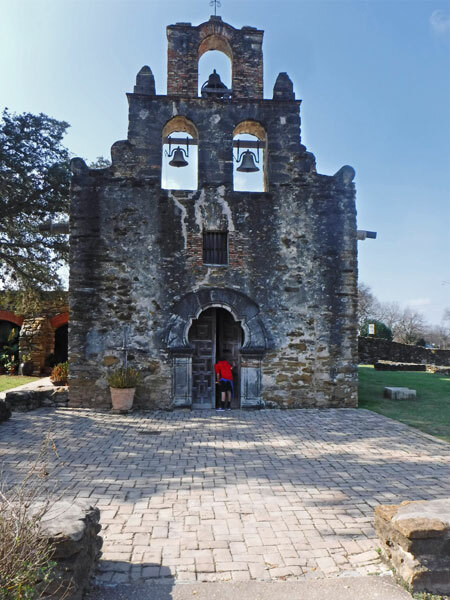 A closer look at the church of Mission San JosÃ©. Weather and looting have robbed the facade of San JosÃ© of its colorful frescoes. But the stone remains. 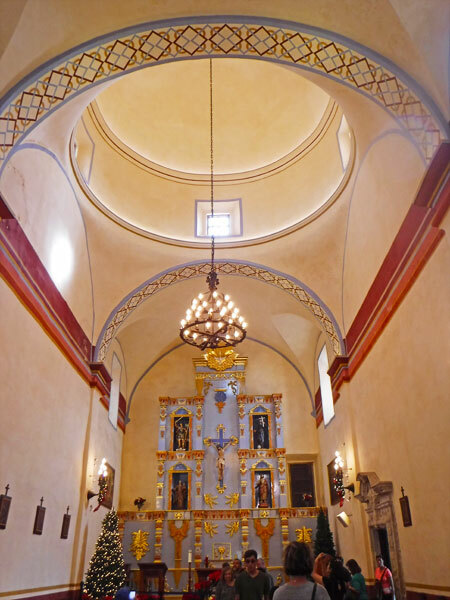 Interior of church at Mission San JosÃ©. The church at Mission San Juan. 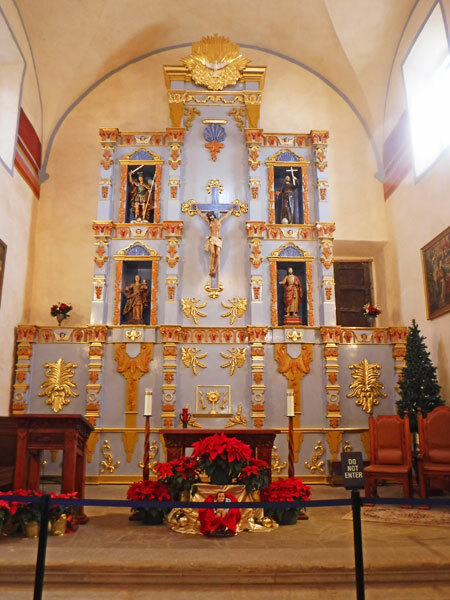 Interior of the church at Mission San Juan. The mission churches still have active congregations. The facade of the church at Mission Espada. 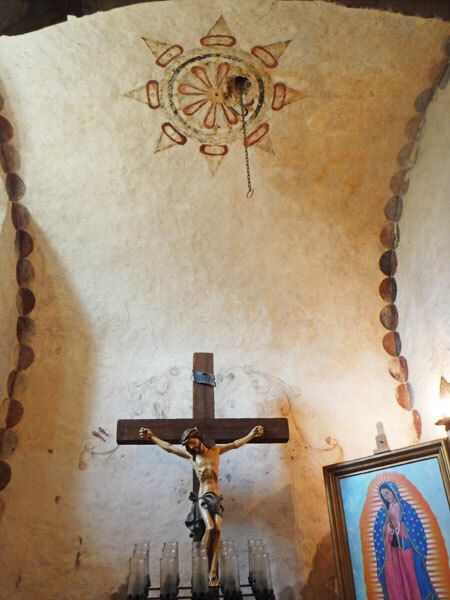 The frescos of Mission Espada are the best preserved. Note the pattern on the ceiling above the crucifix and the circles that line the arches to the sides. 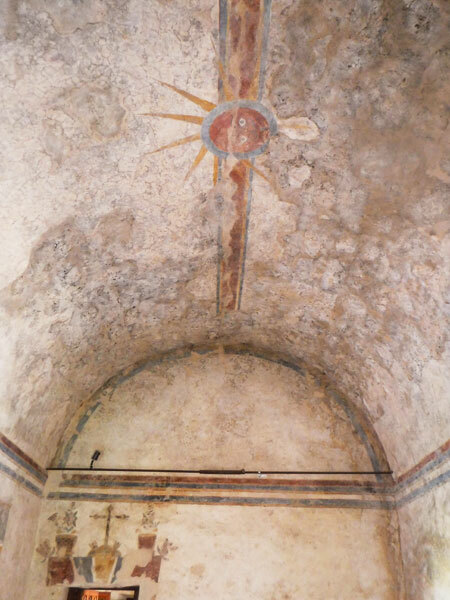 More frescoes at Mission Espada: a sunburst on the ceiling and symbols over the top of a doorway on the left. 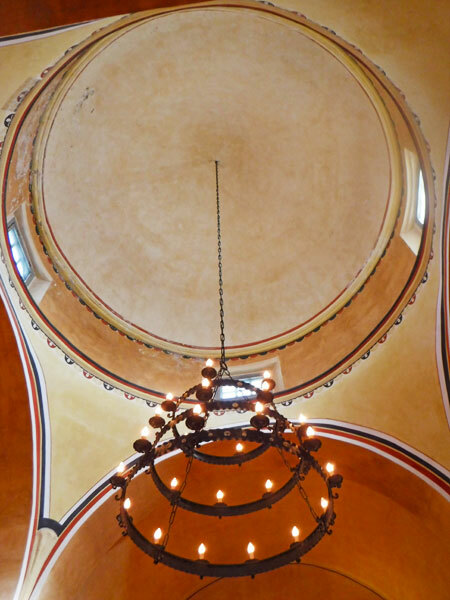 Frescoed dome and chandelier at Mission Espada. The entrance of the church at Mission ConcepciÃ³n. ***All pictures are click to enlarge. 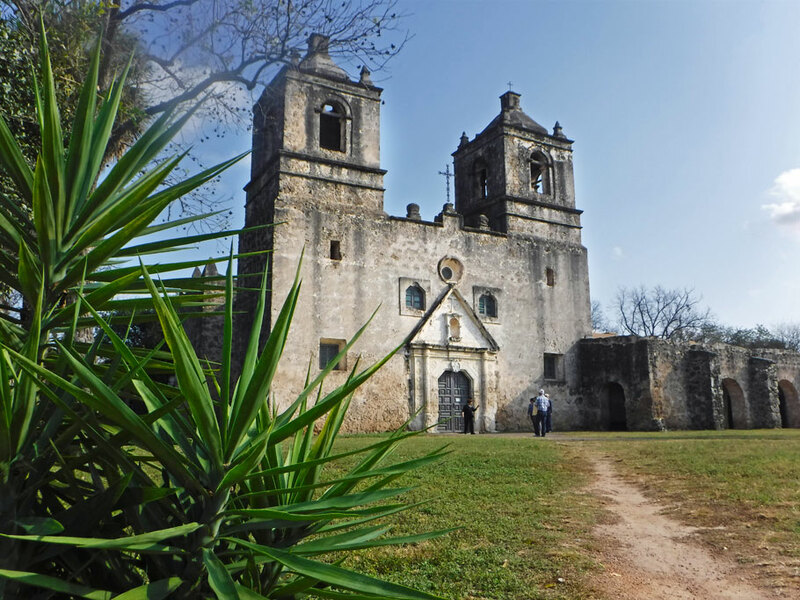 This entry was posted in National Park Service, Texas, Travel On The Dirt and tagged Missions, National Historic Site, National Park, NPS, San Antonio, Spanish Mission, Texas. Bookmark the permalink. Fascinating! Thank you for sharing this history. Buen viaje!